I talked to Chucks Aunt Edna again. We are going out to lunch a Sunday in September. 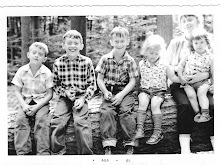 What she remembered is that Robert Stephens was Mary Stephens Sperls father. He is buried in the Civil War Plot in Uniondale Cemetery. Edna also said that Marys brother Jim is buried there too. I read her some of the names with the John Stephens but she did not think any of them were familiar. But, Chuck said (according to his father) that there were two uncles who were Civil War Vets. Jim Stephens was born somewhere 1890-1900 so that would not be him. He could be there too, I have to do more work on this line. I am thinking that Johns could possibly be another Stephens Family brother. He also had daughters named Irene and Mary. 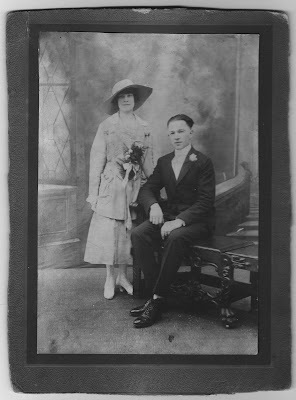 I have a picture of them from Marys Wedding which was 10 April 1918, at St. Anthony's Church, Millvale PA Irene and Ed Scheuring pictured above, c,1918. She did not remember what Mary Stephens Sperls mother's name, but she did remember she was buried in Salem OH. I asked her if the parents were divorced and she said "no" Edna thought that the mother went to live with the daughter after the death of her husband. That daughter was Irene Stephens Scheuring, I found her living in Millvale PA close to her sister Mary Sperl. So, MY THEORY is that UNK mother died in Salem OH between 1913 and 1920. In the 1930 census Irene and Edward were living in Millvale PA, which was close to her sister Mary Stephens Sperl. Irene died in 1957 and Mary in 1986, they are buried in St. Anthony's Cemetery, Shaler PA. Their brothe Jim had died early because Mary took in his son, Jimmy and he was about eight or so at the time. Definition: (1) The originator or original ancestor of a line of descent, a direct ancestor; (2) the founder of a family; (3) the originator of anything, a founder, as the progenitor of a philosophical school.Usage: A progenitor produces progeny, the descendants of a single ancestor (or pair thereof). Back when English was allowed to distinguish between males and females, a female progenitor was known as a progenitrix (plural "progenitrices"). The state or stature of being a progenitor is "progenitorship" and the adjective for this noun is "progenitorial." Suggested Usage: The white families who claimed President Thomas Jefferson as their progenitor were recently confronted by black families who claimed (with reason) to be the progeny of the same man. Jefferson was certainly one of the progenitors of our system of government. While Jews and Christians hold Adam and Eve to be the progenitors of all humankind, it is certainly true that we are all progeny of one couple at some point way back in prehistorical time.Etymology: From Latin "progenitor," the noun of progignere "to beget." This word appear on my "Word of the Day" list and I thought it was very applicable to genealogy. We have many progenitors that make us what we are today.